My Wheaten painting is back from the photographer. The painting, prints and custom prints are available on my web-site http://www.kenbailey.com. The is was a fun painting to do. I'm excited about the product, Irish Soda Bread, sometime known as Wheaten Bread. This bread and Soft Coated Wheaten Terriers are from Northern Ireland originally. The dog and the bread were of the peasants. Nobility didn't tend to have this breed. I also love the profile of these guys. And now I'm realizing I'm painting most of my dogs lately in profile because dog profiles and noses are fun and interesting. The painting is going to be used by my licensing partner ProjectArt LLC for handbags and shoes. I've made this bread before. It is easy and real good. It doesn't use yeast so there is no worrying about the rise. Like the painting of the wheaten terrier. As someone originally from Norn Iron (Northern Ireland) and who actually has a wheaten terrier..I have to say that the how you describe soda bread and wheaten bread is incorrect. These two breads are very different. 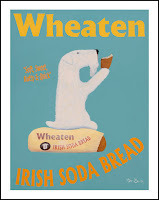 However, understand the confusion, wikipedia is wrong with how it links soda and wheaten bread as one in the same. Incidentally, my wheaten terrier is called Soda. Sorry, I missed your comments for so long. I didn't use Wikipedia for this information, it was from some Irish focused food sites and blogs. I like food, so the research is fun. 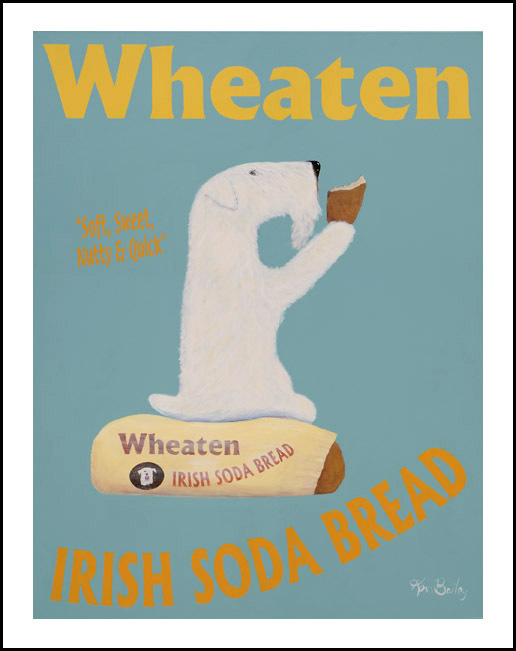 I found several referrals to wheaten bread being a form of Irish soda bread. One called it whole wheat soda bread or something like that another called it fadge. All seemed to have soda as the leavening. Not having first hand knowledge please help me with the deifference.